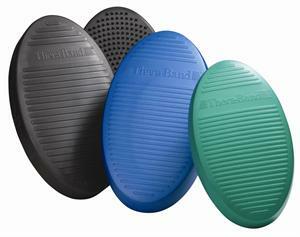 Color-coded pads, supplied in three densities to provide a progressive system of balance training. Green (firm), blue (soft) are effective for balance training in older adults, rehabilitation of lower extremities, and for sports performance enhancement. Black (extra soft) provides advanced challenge compared to the green and blue trainers. The underside of the black trainer has rounded points that can provide tactile inputs for sensorimotor training. Thera-Band Stability Trainers can be used by healthcare professionals for balance and proprioception training for patients who have suffered ankle or knee injuries, core strength and stability training, ankle range of motion and flexibility training and sensorimotor training.